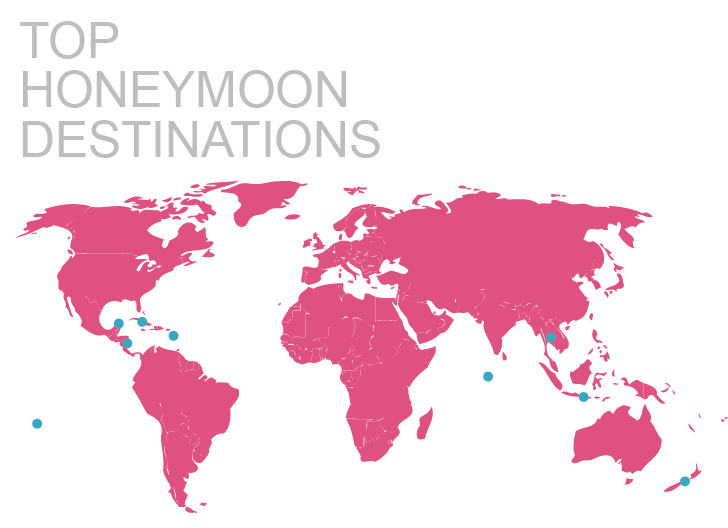 How many times have you been asked "Where are you going for your honeymoon?" Although your travel specialist will ensure your trip is affordable, romantic, and absolutely unforgettable, it's up to you decide where to escape. Do you steal away to the seclusion of a beautiful island or celebrate in a setting full of mesmerizing history and culture? Enjoy a cruise together to the Caribbean or fly across the world to explore an exotic location? Here's a list of the most popular honeymoon destinations around the world to get you inspired to plan your once-in-a-lifetime getaway. And just for fun... Can you guess them all without looking at the answers below? Tahiti, Cancun, Belize, The Caribbean, St. Lucia, Maldives, Thailand, Bali and New Zealand. Worried about cost? Consider a honeymoon registry and give your loved ones an opportunity to invest in your memories. No matter what you dream of, Travel by Cheryl will turn your vision into your reality. Travel by cheryl will be on board this great 28 day sailing will you? Stop by and check out our current travel promotions and shop in our exclusive travel boutique.